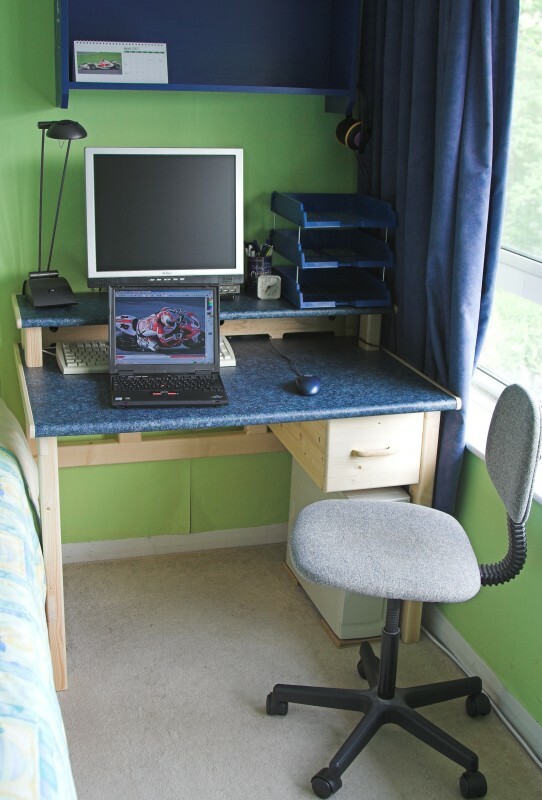 This is a desk I built back in 2007, and I'm sitting at it as I type these words in 2013. 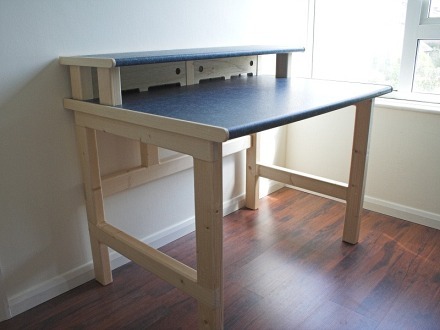 It was designed to fit a tight space (the overall width is only 104cm), but without feeling cramped. The overall depth of 74cm allows for decent legroom, and the monitor shelf frees up desk space while raising the monitor up to a comfortable level. The frame is all built from 2"x3" softwood (planed dimensions about 45x70mm), with half-lap joints. This construction makes the desk feel really solid. The frame is made in three sub-assemblies: left and right leg units, and a back rail section that goes between them. The half-laps where the back joins the legs aren't glued, just secured with some big screws, so it can be knocked down into the 3 sections for easy transportation. The top and shelf are ¾" plywood. The main desk top has an extra lip of ¼" plywood glued underneath to give a little extra stiffness and a more substantial appearance. They are both covered with cushion-backed flooring vinyl, which makes an excellent working surface. The slight amount of give makes it comfortable to work on, it's inexpensive, and it's very hard-wearing. I glued the vinyl to the plywood with contact adhesive. A hot air gun or hairdryer is required to make the vinyl flexible enough to bend around the bull-nose at the front edge. The other edges are trimmed with some strips of pine. The two plywood panels at the back, underneath the shelf, are mounted on magnetic catches and keep all the computer cables out of sight.